The 24-year-old was booked for diving during Hearts' 2-1 win over Aberdeen on Saturday. 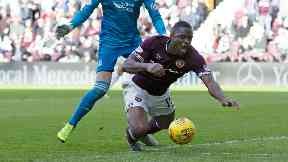 The 24-year-old was booked by referee John Beaton during Saturday's 2-1 Premiership win over Aberdeen at Tynecastle. Television replays showed there was contact between Ikpeazu and Dons goalkeeper Joe Lewis, prompting an appeal from Hearts. The Scottish FA announced on its website that the appeal for a wrongful caution has been upheld and the booking overturned. Ikpeazu, who claimed the winning goal against Aberdeen, was later carried off on a stretcher with a head injury and will miss Wednesday's game at Rangers. Manager Craig Levein said the player is likely to return for the Edinburgh derby against Hibernian this Saturday.